With nostalgia for my Great Aunt Catherine (she loved the cherry blossoms), I made cupcakes. Of course, you could make these cupcakes from scratch, but in true Aunt Catherine form, I used box mixes! I have great memories of stopping at hot dog carts for a coke and a dog during my last trip with her to New York City. She was always on the move and liked to eat Chinese take-out while reading the paper. 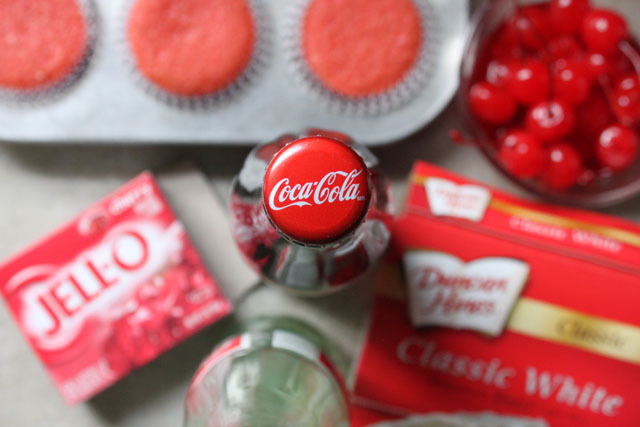 White Cake Mix: substitute Coca-Cola for water, add 5 T Cherry JELL-O powder, follow box instructions. 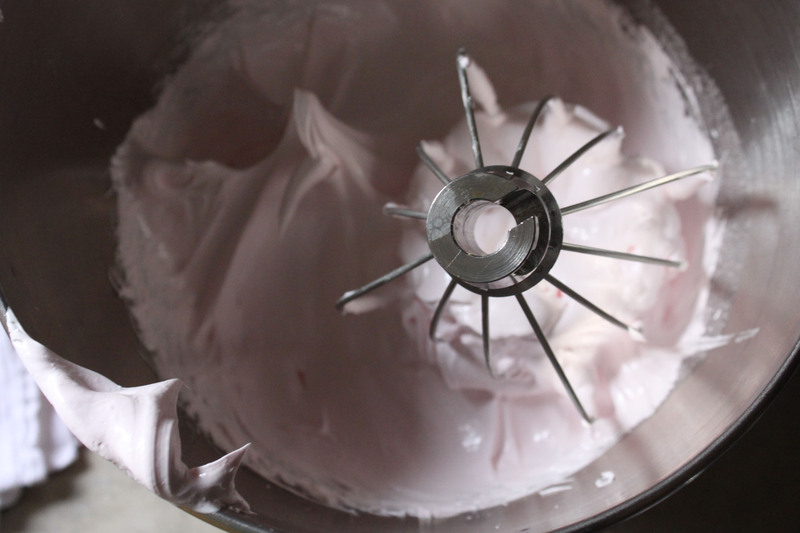 Frosting: Cockylit is my go-to for Meringue, and I added about 2 t Cherry JELL-O Powder to her instructions. 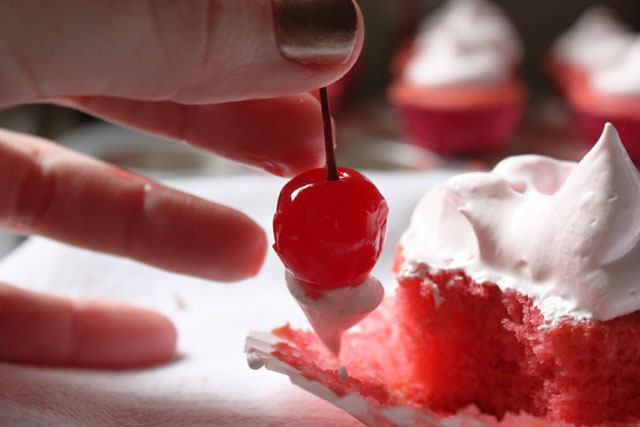 Together: Cherry Vanilla Coke in a cake with a big dollop of pink sugary protein on top! These so appeal to my inner junk food loving child! I can’t wait to try them. Also, your photos are lovely, the colors are really popping in these. It makes me think of summer and trips to the beach. trips to the beach with cupcakes sounds like so much fun! Cozyposts keep getting better and better! 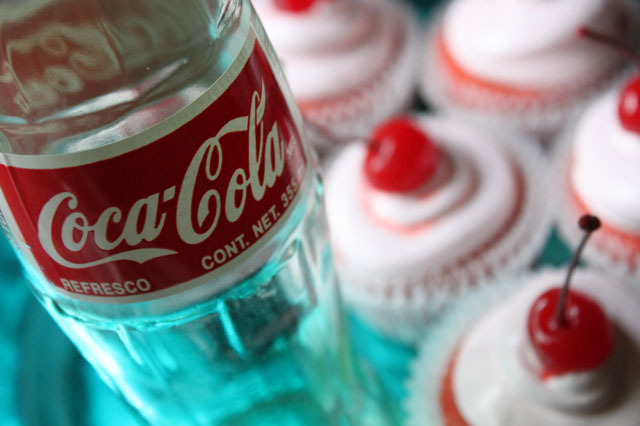 Love the coke bottle blue! thank you, Krista! Making a book would be so much fun – I would love to do it sometime. I agree. A book of your crazy, fun recipes would be great. It would make for an awesome gift idea. You should try doing an e-book! God! This tasted awesome… THANK YOU!!!!!!!!!!!!!!! Had Made it on my mum’s birthday xo! you’re welcome. happy bday to your mum!